A good cup of java wakes you up and puts a pep in your step. Carry your love of coffee with you or create a special gift for the coffee lover in your life with these simple crafts. A cup cozy is the perfect way to keep your hot coffee cup from burning fingertips and knuckles. It also adds pizazz to your mug. It's an easy project for a novice sewer. 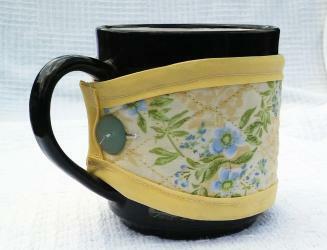 This cup cozy fits larger coffee cups with handles but can be altered for smaller mugs. 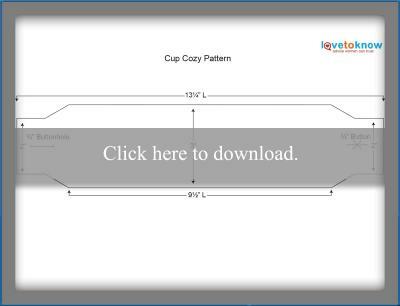 To make the pattern smaller, measure your cup for an exact circumference and make your adjustment from the center of the pattern. The pattern is printed on 8 1/2-inch by 14-inch paper. To use, click on the template in the size you want to open the Adobe file, download and print the design. Pin the pattern to your fabric and cut out. Mark the button placement using a small piece of carbon paper and tracing the mark onto the fabric. Cut the button hole either by folding the pattern and fabric and making a small clip, or using a box knife or razor blade to cut the small slit through the pattern and fabric. Remove the pattern. Start at one end of the cozy and fit the edge of the fabric between the folds of the binding. Pin the binding in place as you go, then sew it on. This can be done by hand but is much faster with a sewing machine. Sew the button hole either by machine or by hand. Attach the button at the mark you made. Make three or four passes with the thread to make sure the button will stay in place. To use the cozy, wrap it around your mug and button it up through the handle. While three beans may not be enough for an emergency cup, it is enough to wear your coffee fashionably. This easy craft is kid-friendly and makes the perfect gift for coffee loving moms, aunts, grandmothers, or teachers. Select the stones that you want to use. 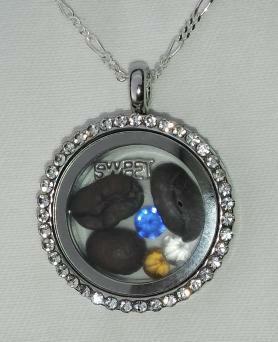 The stones shown here are the April, September, and November stones from the acrylic birthstone set. Open the locket and place the metal charm where you want it to be, either at one side or on top as floating objects will fall to the bottom. Use a glue dot to secure the charm in place. Add three coffee beans and the stones you chose. Close the locket and feed the chain through the bail of the locket. Don't forget to polish off fingerprints before wearing or gifting. This sachet doubles as a coaster. It has a piece of heavy cotton towel inside to protect wood surfaces from the heat of a hot cup. This is best sewn on a machine. Fold the fabric in half with the right sides facing each other. Lay the piece of towel or batting on the fabric making sure that it is even with the fold. Pin the pieces together and sew each side at a 1/4-inch seam allowance leaving the top open. Turn right side out and fold in a 1/4-inch seam allowance on each side of the top opening. Pin to secure. Fill with the coffee beans making sure that all beans fall between the towel and front piece of fabric. Shake all the beans to the bottom. If using the yarn or ribbon for hanging, pin it between the fabric layers at the corner where you begin to sew. Sew the top closed at a 1/4-inch seam allowance. Lay flat and move the beans into an even layer. Brew a hot cup of coffee and enjoy the extra aroma from your coaster when it's heated! 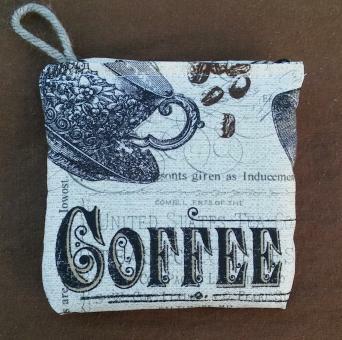 Whether you love coffee or are making a gift for someone who does, coffee themed crafts can be fun to show off and share. These simple projects are also ideal for craft fairs and sales too!